Giacometta Limentani, writer and translator, was a 11-year old student at the time; she attended the school and survived the war. During the event she will be accompanied by friend Paola Fano Modigliani. 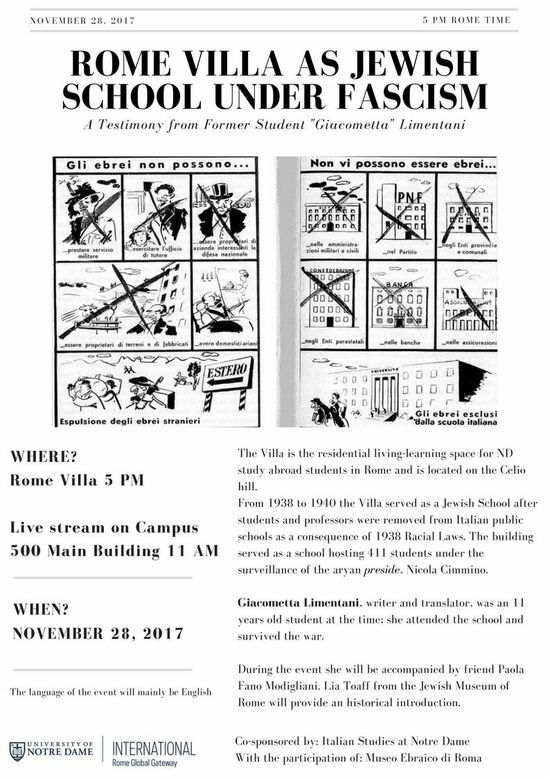 Lia Toaff from the Jewish Museum of Rome will provide an historical introduction.The Villa is the residential living-learning space for ND study abroad students in Rome and is located on the Celio hill. From 1938 to 1940 the Villa served as a Jewish school after students and professors were removed from Italian public schools as a consequence of 1938 Racial Laws. The building served as a school hosting 411 students under the surveillance of the aryan preside, Nicola Cimmino. The event, conducted mostly in English, will take place at the Rome Global Gateway, and will be live streamed at Notre Dame in the Main Building. Co-sponsored by the Rome Global Gateway, Notre Dame International, Italian Studies at Notre Dame, and with the participation of the Museo Ebraico di Roma.